Spring is a busy time for plant lovers: gardens are planted, yardwork begins and spring wildflowers are popping up after winter's rest. My region had a long cold, snow-filled winter and spring has barely made an appearance. As a protected National Scenic Area, the Columbia River Gorge is known for its plant diversity because of its varied ecosystems and elevations. It is easy to fill your spring weekends with hikes to see a wide range of wildflowers in an array of terrains. Except for this spring. We are still wearing winter hats, fingerless gloves and fleece jackets. 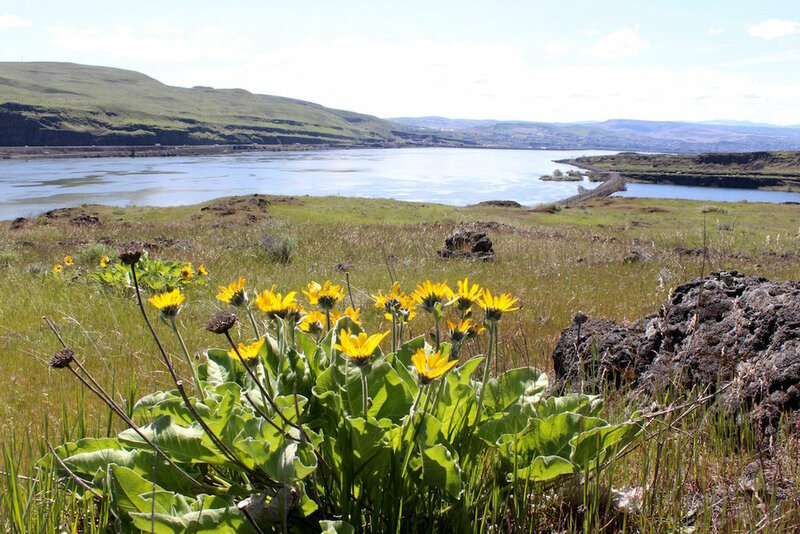 Our local chapters for the Oregon and Washington Native Plant Societies have canceled most regional hikes because the blooms are late to the party. But I managed to find some spring wildflowers, called ephemerals because of their short-lived presence, on the few, sunny & warm days we have had. Catherine Creek on the Washington side of the Columbia River is one of the first spots for spring flowers in the Gorge. Yellow Bells & Grass Widows are the first flowers to appear. Mt. Hood in Oregon overlooks the Gorge. Columbia Desert Parsley (Lomatium columbianum) is a native specific to this region and is the only parsley family plant in the PNW with this color combination. From the Lily Family, Yellow Bells (Fritillaria pudica) are an early spring native that actually appreciates our heavy clay soils. The east side of the Cascades transitions into high desert and is usually warmer and sunnier so flowers arrive earlier. Arrowleaf Balsamroot (Balsamorhiza saggitata) is the widespread species of the Balsamorhiza genus and often grows in large patches in open fields where it can extend its roots deeply into rich soil. Partners in beauty, the legume Lupine sp. is often found growing next to balsamroot. Legume members are nitrogen fixers and contribute to the success of nearby plants. Somewhat ubiquitous in WA and OR, Oregon Grape (Mahonia spp.) is found in both forested and open terrain. Those bright yellow flowers will become purple-blue berries that are edible but sour. Oregon Grape keeps it tough leathery leaves year-round and many plants feature bright red leaves. Oregon Grape is on the United Plant Savers To-Watch List as its potential for antibiotic use is being researched. Another member of the Lily Family, Trillium ovatum, is such a delight to to find under a large tree and is always the first flower to bloom on my property. As the blooming season progresses, some trillium flowers will change to a dark rose color. Why? One theory contends that once pollinated, the flowers change color to let pollinators know the job is done. Never pick them, and they will grace your garden for over two decades. Mushroom hunting on a sunny Saturday in the Ponderosa Pine forests of the Blue Mountains of NE Oregon was not successful but I was secretly thrilled to find several species of wildflowers. Ballhead waterleaf (Hyrdophyllum capitatum) is a common wildflower in the east-side forests of the the PNW. I love their hairdos! Another member of the Lily Family, the elegant Glacier Lily (Erythronium grandiflorum) was abundant in the higher elevation forest. These are one of the first flowers to bloom after the snow melts. One of my favorites, Shooting Star, loves moist hillsides. There are six species in the PNW and so you'll need to pay attention to leaf structure and time of bloom...which I didn't do on this trip. 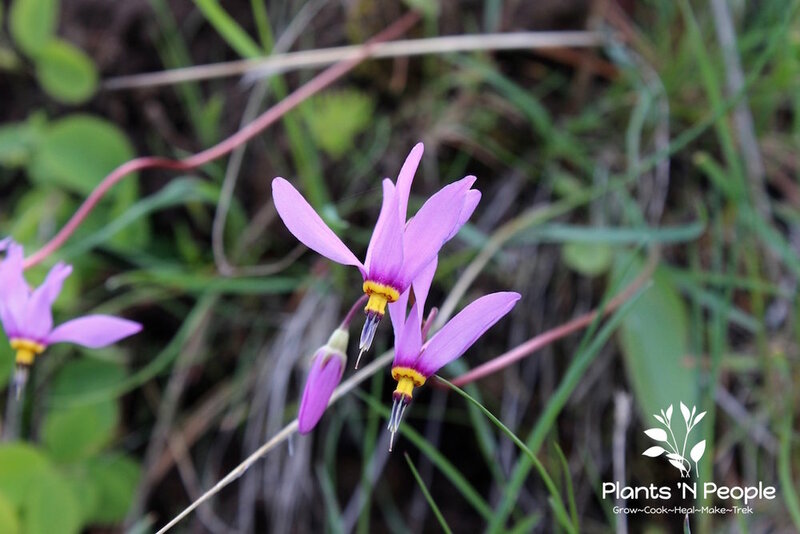 It's either Dodecatheon conjugens or D. pulchellum...have to wait until next year to determine. I was so excited to find this Western peony AKA Brown's peony (Paeonia brownii) in bloom. Last year, I saw this same plant for the first time but the blooms had gone to seed (which are spectacular, too). The plant apparently prefers moisture as there were several plants in the same area and all with multiple flowers which was not the case last year. Delicate-looking Slender Woodland Star (Lithophragma tenellum) can get missed among the growing grasses and other flowers. I saved the best for last: this was a first for me. As we turned onto an old logging road, I saw the brilliant blue and my friend, Lynn, called them bluebells. They were surrounded by miner's lettuce and as we kneeled to take photos, this incredible sweet smell met my nose. A member of the Borage Family, the common name is Trumpet Lungwort AKA Leafy Bluebells (Mertensia longiflolia). I will be looking for them next spring!